We are asking YOU to take our case! 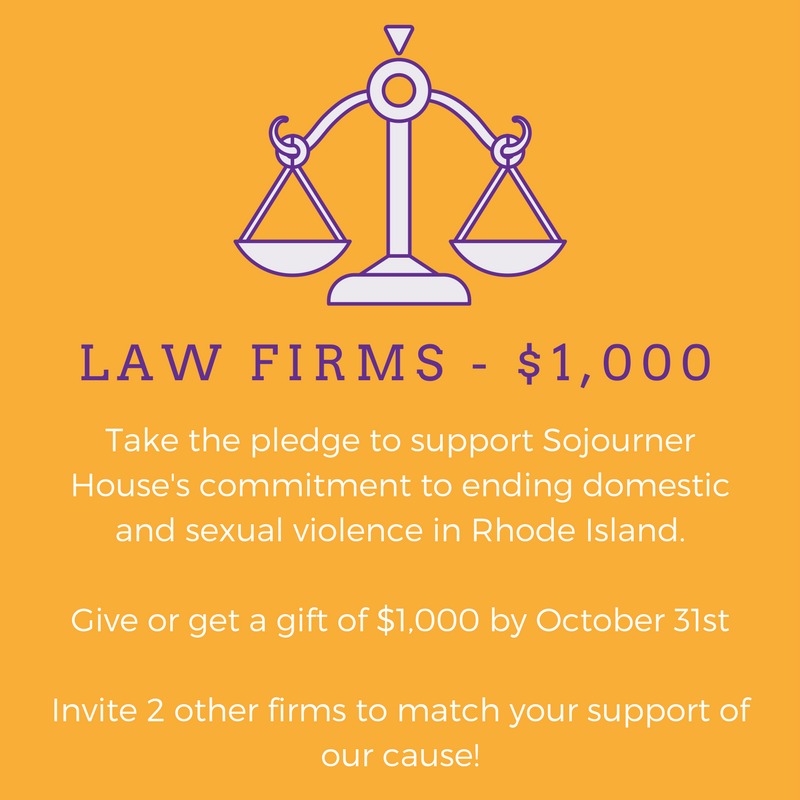 During the month of October, Domestic Violence Awareness month, we are asking Rhode Island law firms and individual attorneys to help us raise $15,000 by October 31st to support the programs and services we offer for victims of domestic and sexual violence, children who witness abuse, and the greater Rhode Island community. We are charging the legal community to work together in support of our mission to end domestic and sexual violence in our community. To participate, we ask that you raise or make a gift of $1,000 for law firms, or $250 for individual attorneys, and to challenge your colleagues to do the same. Firms and individuals who meet their goal by October 31st will receive year-long recognition on our website, VIP tickets to our upcoming Masquerade Ball on November 17th (2 tickets for individuals, 4 tickets for firms), and special recognition in our Annual Report. You can make a gift directly by clicking the "Donate" button below, which will direct you to our campaign page on Razoo. From there, click the "DONATE NOW" button on the left, and follow the steps as prompted by Razoo. You can raise your goal amount by creating a fundraising page on Razoo. To do so, simply click the button below which will take you to Sojourner House's 2017 Legal Community Campaign page. From there, click "Join this Team" and follow the steps as prompted by Razoo. Once you are done, share your page with your friends, family, and co-workers and ask them to make a donation in support of your efforts! The Law Office of William J. Conley, Jr.